tl;dr: After a rocky fourth quarter, venture capital investment in India and Southeast Asia is back. Vroom vroom! It’s not only the United States’ venture capital market that is confusing the media. Specifically, if we look at Asia, there are a number of conflicting public reports concerning its current fundraising climate. Depending on which article you read, you might think that it’s all gloom and doom, or believe that Asia’s startup ecosystem is on the verge of exponential growth. Today, we’re going to crunch the numbers to figure out what’s actually happening. To get a grip on what is going on in Asia, we’re going to look at funding data of two startup ecosystem hotspots in Asia: India and the Southeast Asia region. Similar to Alex’s earlier approach at evaluating US venture market, we will look at both the aggregate capital deployed and number of deals as a proxy for the pulse of the startup market. To kick things off, let’s start with India. Capital deployment in India continues to climb following its jump in 2014. Compared to Q1 2015, Q1 2016 saw an increase in capital deployment by 31.8 percent. The pullback in funding that occurred in Q4 of 2015 has mostly recovered, with Q1 2016 putting up the highest total second only to Q3 2015. 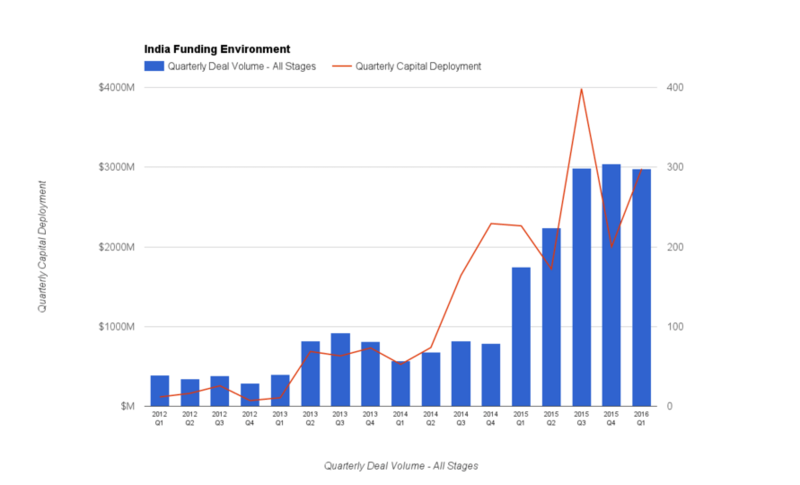 However, while capital deployment has bounced around, total deal volume plateaued at around 300 deals per quarter in the last 3 quarters. One possible explanation could be that the infrastructure supporting India’s technology ecosystem has reached its full capacity. Alternatively, investors could be skittish, remaining on the sidelines waiting for a correction in valuations to take place before investing in more deals. Either way, it will be interesting to keep an eye out moving forward. Now let’s take a look at the Southeast Asian funding landscape. For Southeast Asia, I took a different approach. Given the infancy of its startup ecosystem, significant rounds have an outsize impact on its quarterly tallies. To correct for that, I created a secondary series excluding funding events that totaled more than $100 million. Their removal grants us a more accurate look at the general funding pace of the area, as 90 percent of deals in Southeast Asia are Seed or Series A rounds. Capital deployment in Southeast Asia nosedived in Q4 2015. However, Q1 2016 results show that the region is recovering from the plunge. Similar to events in India, venture funds have picked up where they left off before the end of 2015. The result? Q1 2016 narrowly lost out to Q4 2014 as the highest recorded performing quarter in terms of adjusted capital deployment. Looking at the number of deals, volume has hovered between the 85-95 band per quarter for more than a year now. My hypothesis is that venture capital firms are moving up the ladder and investing in later rounds. With more funds focused on growing some of the earlier startups, there may be slower growth for the number of deals in Southeast Asia in the short term. Based on our data, both regions’ pullback in capital deployment in Q4 2015 seems to be a knee-jerk reaction. Capital deployment has since recovered and deal volume is relatively flat. It definitely seems like it is business as usual in both India and Southeast Asia. In India, it appears that stakeholders within the ecosystem are long-term bullish. The government, for example, has raised a USD$1.5 billion fund for startups and is coming up with better programs to support the ecosystem. Also, top tier venture funds like Sequoia Capital, Accel and SAIF have raised bigger funds dedicated to follow-up rounds in Indian companies. On the other side of the equation, there is growth in the country’s angel investing and micro seed funds. The recent moves by industry players in Southeast Asia suggest that this is only the start of the startup boom in the region. 3 of the top 5 most active investors in Southeast Asia raised more money for their warchest in 2015. Governments across the region have also recognized the immense economic benefit startups can potentially bring to the economy. Notably, Singapore’s Prime Minister—who coded this Sudoku solver in C++—came to Silicon Valley to woo Singaporean engineers to return home. Besides Singapore, governments in Indonesia and Malaysia have also devised programs to nurture their budding startup ecosystems. Looking ahead, things seem promising. Hopefully the best is still to come. Featured Image via Flickr user Joe Le Merou under CC BY 2.0. Image has been cropped.